We are thrilled beyond belief with all we’ve accomplished during the primary science phase. CRISM has made about 9,000 targeted observations, observing selected regions at 20 meters per pixel, more than three times what we expected. We’ve also mapped about 60 percent of the planet at 200 meters per pixel. For me, the highlights of the first two years were finding that clay-like minerals are so widespread, and finding new minerals that had never been seen from orbit before. The major example - that's been published - is opal and related minerals. Another really significant new find of a sought-after mineral is on track to be published in December. What these findings tell us is that in Mars' earliest history, there were times and places where the planet was pervasively wet. Finding new minerals, like opal and its close relatives, was probably the most exciting discovery because they were brand new, never seen before from orbit. These new minerals tend to be fingerprints of specific kinds of environments or processes so - when we find them - of course the team goes to extraordinary lengths to make sure our claim is accurate. We did face some technical challenges, of course, one of them being that in space, the images are a lot “noisier” than they were when we tested CRISM on Earth. In other words, the images have an assortment of bright pixels and streaks that we hadn't been seeing on the ground. That's almost certainly because, in space, the detector gets upset by cosmic rays that don't reach the ground. Seeing the extra bright pixels and streaks was a surprise and we've had to spend a lot of effort working around them and filtering them out. But our efforts seem to have paid off, and you can see that for yourself in the CRISM gallery. It's also really challenging that the workload never ends! Whenever we deal with one week's (very daunting) workload, the next week's workload is already on us. Many days we’re in the CRISM Science Operations Center into the wee hours of the morning, and weddings and babies have been planned around solar conjunction because that's the only major let-up in activities. Despite all of the hard work, it’s been incredibly rewarding for our team to be in the thick of picking where Mars landers will go (including Phoenix and Mars Science Laboratory), and finding so much evidence for water in so many different environments that it will take a whole series of landers to visit each of the water-related rock types. We can’t wait to start the extended science phase at the end of December, when we’ll begin covering more of the interesting areas at high resolution to piece together a more complete picture of Mars' early history. I’m sure you’ll hear more about CRISM’s exciting discoveries on Mars throughout the next phase of MRO's exciting exploration of the Red Planet! CRISM isn't the first Mars-orbiting mineral mapper. It followed the Thermal Emission Imaging System (THEMIS) on Mars Odyssey, among other instruments. One of THEMIS's most important findings is outcrops of rocks whose properties can only reasonably be matched by common chloride salts. These outcrops tend to occur in depressions, suggesting the possibility of dried-up salt lakes or what is called alluvial fans, where ephemeral streams deposit salt and sediments into low-lying areas. Naturally we've had CRISM looking at these areas, and what we've found adds to the story about these "chloride" deposits. The map below shows strips of CRISM global mapping data (the darker stripes in the map) overlain on a THEMIS image mosaic of a region called Terra Sirunum, where one of the largest concentrations of "chloride" deposits occurs. The elevations in the region vary by 3.5 kilometers, and elevation contours (lines of equal elevation) are overlain on the map to show high and low areas. The purple contours indicate low elevations, and the orange contours higher elevations; closely spaced contours indicate steep slopes and widely space contours indicate gentler slopes. Note that the central part of the map is relatively flat and low in elevation. The pink circles represent THEMIS detections of "chloride," which are highly clustered in the middle of the flat, low-elevation area. Within the strips of CRISM data, blue indicates eroded basaltic rock, red indicates iron-containing silicates, and green indicates clays and related minerals, together called phyllosilicates. Note that the largest blotch of green and red occurs in the middle of the low, flat area, coinciding with the "chlorides." This suggests that whatever process deposited the chorides might also have formed phyllosilicate deposits. Elsewhere on the planet, where there is evidence for ancient lakes, such as in Jezero crater, we see that phyllosilicates were concentrated by erosion from the watershed and deposition in standing water. So if this part of Tyrrhena Terra ever had a lake, perhaps that lake deposited both chlorides and clays. 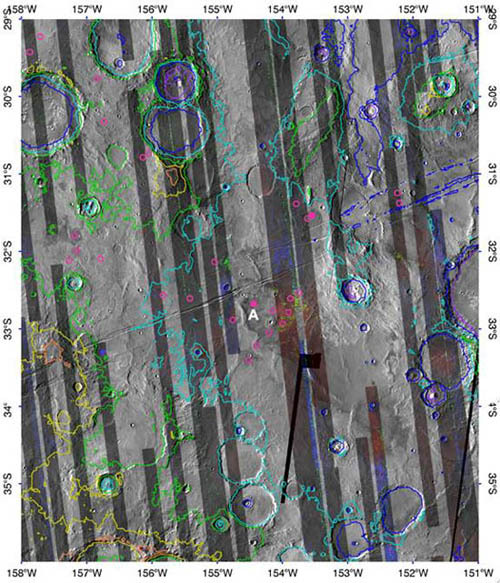 Higher-resolution targeted observations, such as one covering the candidate "chloride" deposit at the location in the map marked by the letter "A," provide a further level of insight into the past environment in this part of Mars. 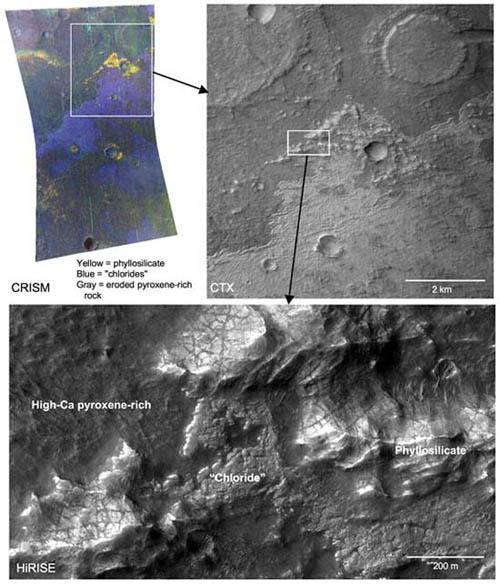 Typically CRISM's targeted observations are taken together with images from MRO's Context Imager (CTX) and High-Resolution Imaging Science Experiment (HiRISE) whose extremely high spatial resolutions provide complementary information about landforms. The montage below shows the region at "A" under the scrutiny of all three instruments. In the CRISM image, at the upper left in the montage below, different false colors are used to show the spectral signatures of different minerals. The blue areas have a distinctive spectrum that correlates with the "chloride" deposits, the yellow areas have phyllosilicates, and the gray areas are eroded basaltic rock rich in the iron-containing mineral pyroxene. The close spatial association of the blue-colored "chlorides" and the yellow-colored phyllosilicates suggests that the relative ages and layering will be evident in the data. Zooming in to the largest phyllosilicate deposit first in the CTX image (upper right) and finally the HiRISE image (bottom), the geologic relations between the different rock types is clarified. In the HiRISE image, a thin, fractured layer of medium-gray "chlorides" sits on top of the dark gray, pyroxene-rich rock, showing that the "chlorides" are younger. The wind-eroded remnants of light-colored, more coarsely fractured phyllosilicates sit on top of the "chlorides," whose formation must have been followed by a period of phyllosilicate deposition. Not only did water-related minerals form in this site, but which ones were deposited changed with time, probably in response to changes in the local environment!